James Corden is an Emmy Award-winning, multi-faceted performer, host, writer and producer with accomplishments that span television, theater, film and comedy. Since he took over as host of The Late Late Show on March 23, 2015, the show has won an Emmy Award for Outstanding Interactive Program, won a Critic's Choice Award for Best Talk Show, achieved its highest ratings since the show's inception in 1995, and has become known for Corden's groundbreaking videos and sketches, including the viral phenomenon Carpool Karaoke. The Late Late Show won an Emmy Award for Outstanding Interactive Program in 2016. Also, The Late Late Show Carpool Karaoke Primetime Special won an Emmy for Outstanding Variety Special in 2016 and 2017. Additionally, Corden earned an Emmy Award in 2018 for Outstanding Actor in a Short Form Comedy or Drama Series for James Corden's Next James Corden series on Snapchat, which also earned an Emmy for Outstanding Short Form Comedy or Drama Series. 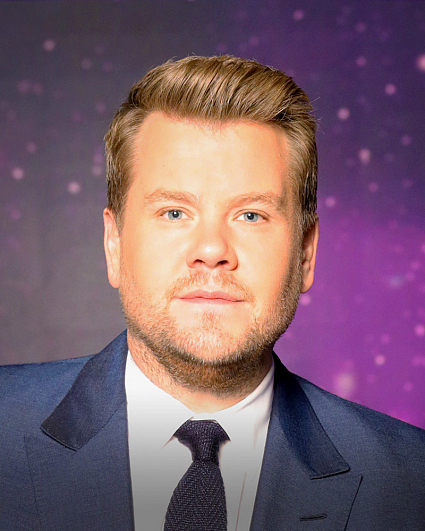 Corden will host the new competition series The World's Best, which debuts following Super Bowl LIII on Feb. 3, on the Network. Corden is the co-creator and executive producer of the Carpool Karaoke series for Apple Music, which earned an Emmy Awards for Outstanding Short Form Variety Series in 2018. Also, he serves as executive producer on Drop the Mic, on TBS. In 2016 Corden hosted The 70th Annual Tony® Awards, which had its largest audience in 15 years and won the Emmy Award for Outstanding Special Class Program. In 2017 and 2018 he hosted The Grammy® Awards. Corden came to American late-night television with a growing list of award-winning and critically acclaimed credits. He is a Tony Award-winning performer on Broadway, a BAFTA-winning star of a U.K. television series, a feature film actor, and an acclaimed host, writer, and producer in several genres of television. Corden hosts the BAFTA Award-winning UK sports-themed comedy game show A League of Their Own on Sky 1 and stars in, produces and writes the BAFTA-nominated comedy thriller The Wrong Mans, which is available on Hulu and airs on the BBC. In 2013 Corden was awarded the Royal Television Society Award for Comedy Writer of the Year for his work on the show. Outside of his native England, Corden attracted international attention as the lead in the hit comedic play One Man, Two Guvnors, performing first in the National Theatre and the West End in London and then on Broadway, which earned him the 2012 Tony Award for Best Leading Actor in a Play. His additional theater credits include the worldwide tour of The History Boys in the role of Timms, which he also played in the feature film adaptation. On television, Corden starred as Smithy in the critically acclaimed BBC comedy series Gavin and Stacey, which he co-created and co-wrote. For his role, he earned the BAFTA Television Award for Best Male Comedy Performance in 2008 and the British Comedy Award for Best Male Comedy Performer in 2007. The series received the British Comedy Award for Best TV Comedy in 2008 as well as the National Television Award for Most Popular Comedy Programme in 2010. Prior to that, Corden starred in the British television series Fat Friends from 2000 to 2005, which earned him a nomination for the 2000 Royal Television Society Award for Network Newcomer On Screen. Also, he appeared in the BBC television movie Esio Trot, alongside Dustin Hoffman and Judi Dench. In 2011, Corden had a recurring role in the popular BBC science fiction series Doctor Who as Craig Owens, the Doctor's roommate. In addition, Corden hosted the Brit Awards, the biggest event in the British music industry, from 2010 to 2014. On the big screen, Corden starred opposite Meryl Streep, Johnny Depp and Emily Blunt in the Golden Globe Award-nominated feature film Into the Woods. His additional film credits include Begin Again, with Keira Knightley and Mark Ruffalo; How to Lose Friends and Alienate People, with Jeff Bridges; Gulliver's Travels, with Jack Black; and The Three Musketeers, with Orlando Bloom. Next, he will be seen opposite Sandra Bullock, Cate Blanchett, Anne Hathaway, Mindy Kaling, Rihanna and Helena Bonham Carter in Ocean's Eight. Corden voiced Hi-5 in the animated film The Emoji Movie and Peter Rabbit in the animated film Peter Rabbit. He will star in the upcoming film adaptation of Andrew Lloyd Webber's smash musical Cats. Over the course of his career, Corden has been awarded the Writers' Guild of Great Britain Award for Comedy Writer of the Year, the South Bank Show Award for Comedy, the TRIC Award for Best Comedy and the National Television Award in for Best Comedy. Corden is from High Wycombe, England and currently resides in Los Angeles with his wife and children. Follow him on Twitter @JKCorden and Instagram @j_corden.